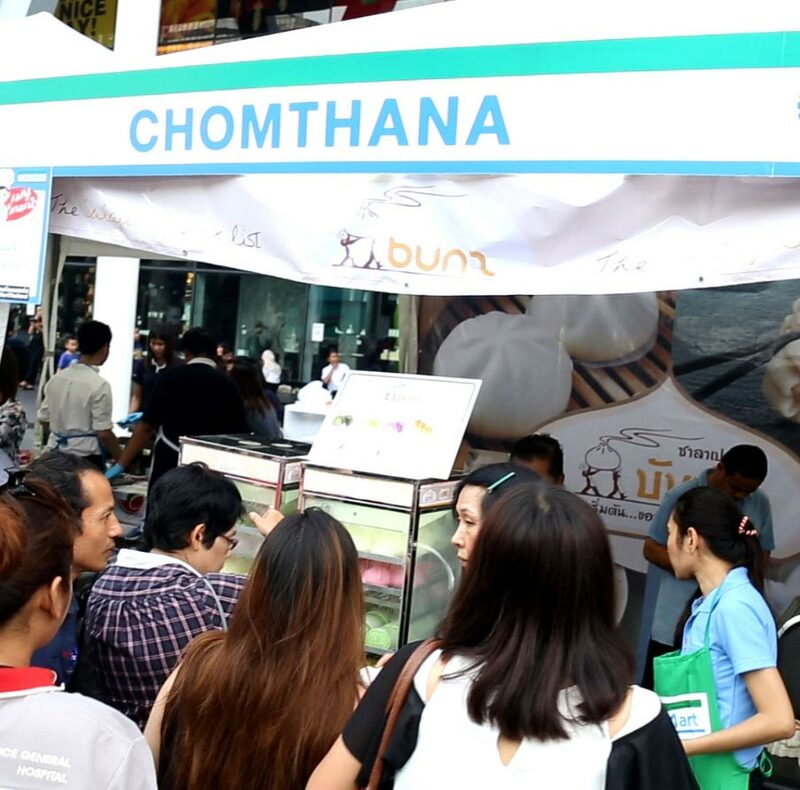 Chomthana was represented by its dimsum brand ‘Bunz Salapao’ at the Family Mart Food Fair at Centralworld in Bangkok. The crowds gathered at the wide open space in front of shopping complex Centralworld were luckily able to enjoy the various foods at the tasting stalls offering free food for the night. Over 200 different food products were available for tasting; everything from cakes to delicious buns such as ours. Despite the heavy and persistent rain throughout the day, when the event opened to the public at 1700, the rain miraculously stopped. Chomthana & Bunz Salapao gave its salapaos (ซาลาเปา) or Chinese dim sum buns for the crowds to try. Premiering for the first time were our latest flavours: Green Tea Red Bean and Salted Egg with Minced Chicken. As the event extended into the night, attendees devoured the Chinese dim sum goodies hungrily as the weather thankfully freshened up. Chomthana would like to thank its supporters and Family Mart Thailand for giving us the opportunity to take part in this wonderful event. We look forward to seeing you all at our next event soon!